When my brother got married, he took a week off going around meeting all our relatives. It's a Malay tradition which is to introduce the partner to one's family. So one of his relatives that had the pleasure of being treated was me and the Husband! Haha. I just realised I haven't blogged about their wedding! I will get to that soon, now that finals are over and I have until February before the next (and my FINAL) semester starts. Anyway, Amirah (Dr. Tengku Nurul Amirah) had heard about the Orchid Conservatory in Majestic Hotel Kuala Lumpur awhile back and thought of bringing me here since I have expressed ideas on blogging about a series of Tea Time Places. They have brought me to other places as well but we never took proper photos being the gluttonous persons we are. We always forget to take pictures of the food until we ate a portion! I'm 5 days late but final exams are like killing me. So, yeah. 2015 has been a huge year for me. I think I grew up so much in the past 12 months. I lost my job because my program was cut. It's called 1MDB - Yayasan Sime Darby Work Grant. I don't think I need to explain why the program got cut. I did my Law Attachment Program in Ipoh for 3 months. A lot of people wondered why I did it there instead of in KL where it's like 'happening' and where the Husband is. So here's my answer: I wanted to live with my family. Who knows what will happen when I graduate June 2016? I don't think I will be living in Ipoh for the next few years at least. A lot of people couldn't understand that I felt really sad about leaving the life I knew. This is part of growing up. But it's still nostalgic. I did a collaboration with Sea-Citizen.com designing skirts: Out Of The Woods, Into The Sun! That was really cool although the promotions are just starting now. I am so happy to know that my skirts are selling in Europe! I have been working in the fashion industry doing odd jobs like managing fashion shows as well as managing photoshoots. I really love the work because it's all about creativity and fun! Of course hard work plays an important role as well. Right now I'm just focused on my degree which is why my blog has been left to dust a bit. I'm just posting today because I miss you, my dear readers! I know it's horrible of me to stay quiet all the time. I barely update on Instagram either! It's my final 5 months and the course is getting tougher and more time consuming then ever. Please pray for me! 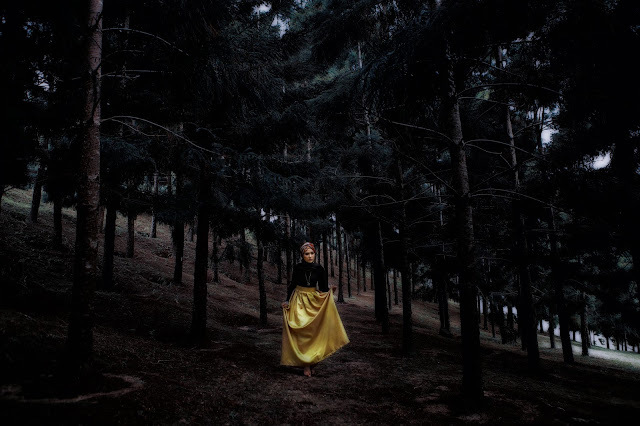 Taylor Swift just released her Out Of The Woods video moments ago and I couldn't help realising that the concept was very similar to a shoot I had for my collaborative collection with Sea-Citizen.com called Out of The Woods and Into The Sun. You can read about the first collection here: STYLEBYSYA for SEA-CITIZEN.COM A/W '15: OUT OF THE WOODS where I talked about my inspiration and shared photos from the editorial shoot with Langston Hues. However, I will be preserving Into The Sun for S/S '16. So wait for it!